We had breakfast at La Marotiere, our B&B in Mareuil-sur-Äy, with just the two of us in the breakfast room at 9 am. 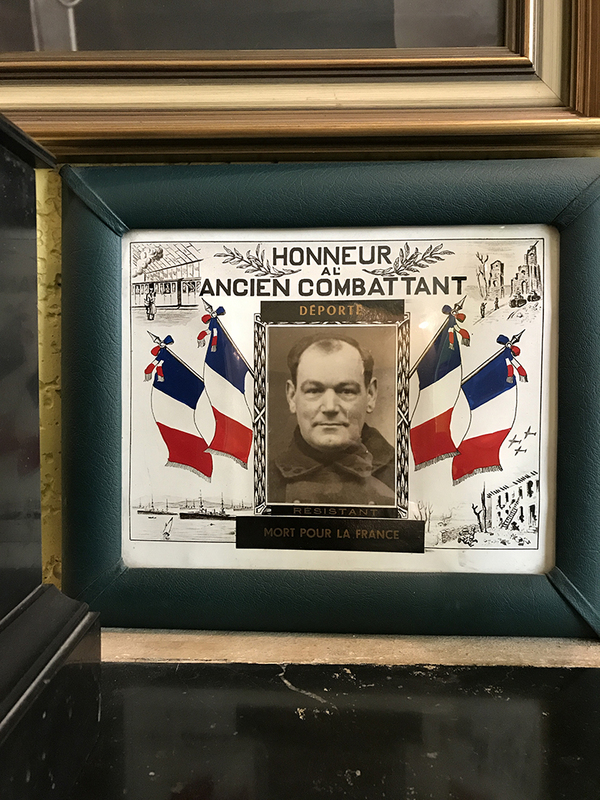 We noted several interesting items in the room, such as the portrait of a WWI French soldier hanging above the mantel, and a framed photograph of a man who served in the French Resistance in WWII, and two WWI artillery shells worked into flower vases with designs etched and hammered on them. We asked Mme. Giraud about the photographs, and she said the man in the portrait above the mantel was her husband's grandfather (the same picture appeared on the bottle of champagne we drank the night before -- Champagne Leon Giraud.) The man who served with the Resistance was her husband's uncle, who did not survive the war but died in a concentration camp after he was deported. 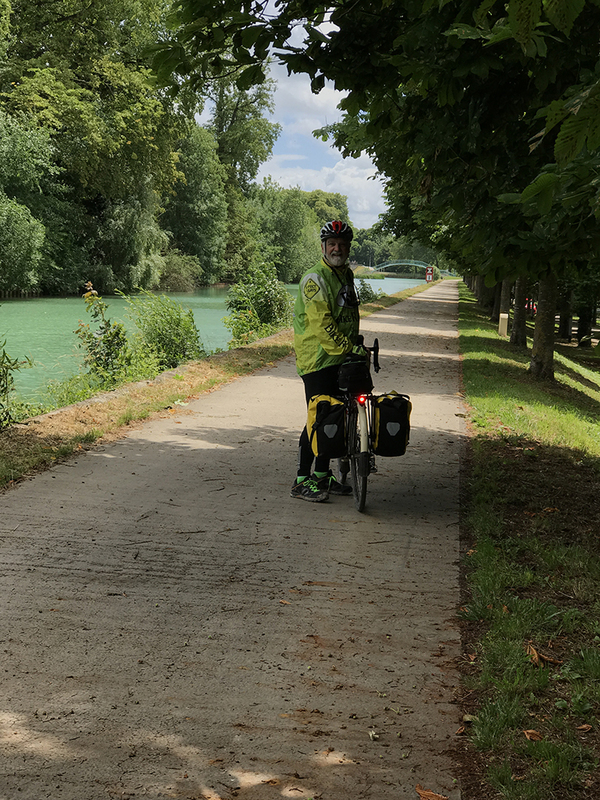 As we cycled along the canal, we passed through Conde-sur-Marne, where the Aisne canal meets the Marne canal. 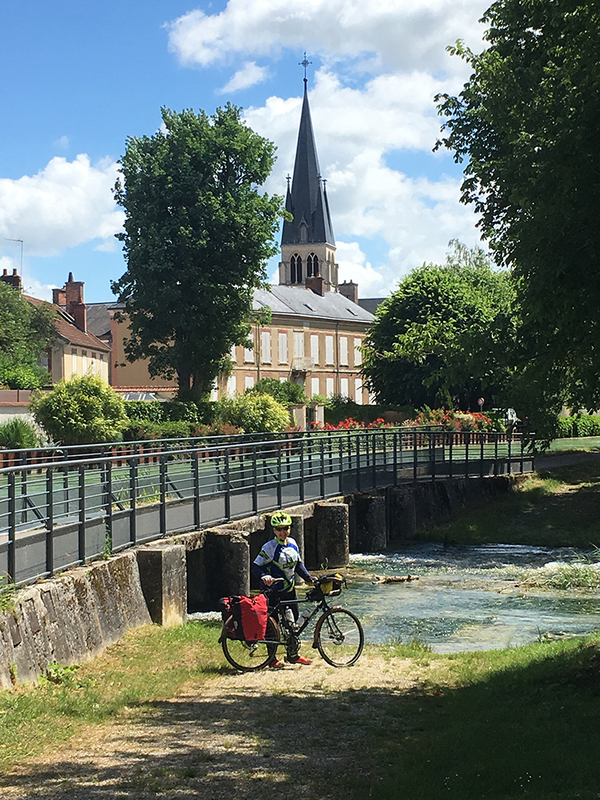 Just before that town, we crossed a small bridge where a side stream ran under the Marne canal and emptied in a little waterfall into the River Marne which runs alongside the canal. We saw herons and people fishing from the banks of the canal, but we never saw any of them catch anything. We stopped in the village of Vraux to get bread and some jambon, but they were sold in separate shops across the street from one another. We went first to the boulangerie and bought a small baguette, a croissant and a fried apple pie. We asked the shopkeeper to split the baguette lengthwise for us, and then we went across the street and bought two slices of ham. The butcher was much friendlier and interested in talking with us a bit. He does all his own butchering and makes the sausages by hand. 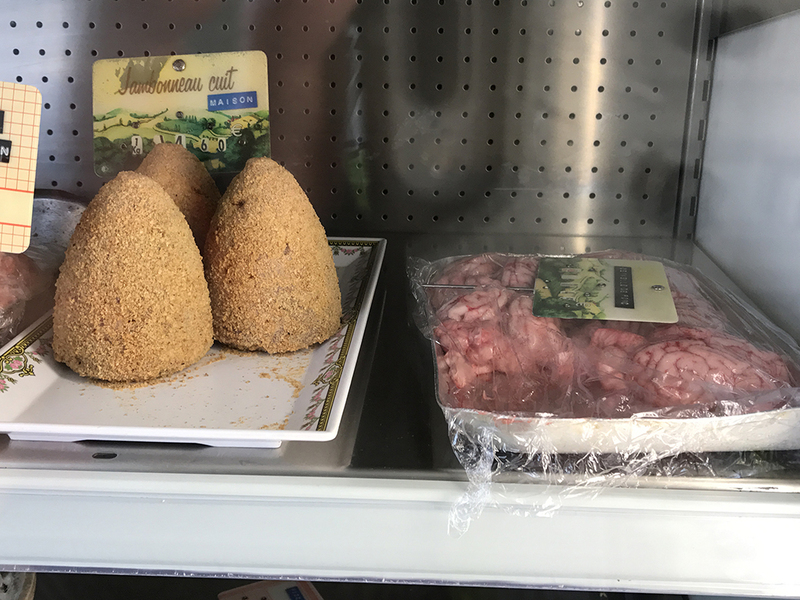 There were all manner of interesting things on the shelf in there, including a dish of pork brains, which we managed to resist. The weather for the day started out partly cloudy, but as the afternoon wore on, dark clouds gathered behind us. Riding along the canal, we were somewhat sheltered by the row of trees to our right, but as the wind picked up, I was rather glad that we were wearing bike helmets because of all the flying twigs and sticks raining down on the trail. Still, the wind was mostly at our back and we did not want to miss out on the opportunity to make good time while we could. We kept an eye on the sky, though, and we could see heavy showers both in front of us and behind us. Finally, in the little town of Chepy, we knew we were not going to outrun the storm, and we took cover in a concrete bus shelter near the edge of town. We waited about 20 minutes for the storm to pass. While we waited, Steve started singing, "Mapmaker, Mapmaker, make me a map." That started us off on a series of goofy jokes about songs on the Lewis & Clark Trail. We had already been thinking of scenarios of Lewis & Clark in the new millennium -- how they would probably use cell phone technology if they were mapping their way to the Pacific today, and how Clark would probably annoy Lewis no end (this is Steve's favorite theme) by asking to borrow his things. "Hey, Meri, can I use one of your converter plugs? This Lakota converter I've got isn't working for me, and you've got one of those Mandan converters, don't you?" We also entertained ourselves with various song titles that would probably have been in the "hit parade" during Lewis & Clark's time -- such as "Mamma Don't Take My Pemmican Away" or "Here's to You, Sacagawea." The rain ended (or maybe we were just desperate to get back on the trail and get to our hotel to have some coffee and stop our brains from sliding deeper into the abyss), and we proceeded on. 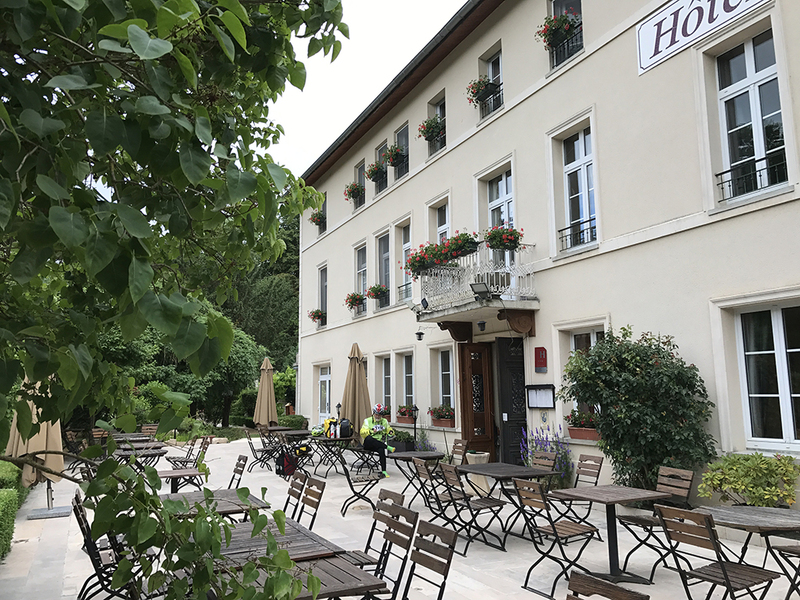 We arrived at our the Hôtel Clos de Mutigny in La Chaussée just before 4:30 pm. We got cleaned up, had some coffee, followed later by a big glass of Belgian beer, and caught up on our email. 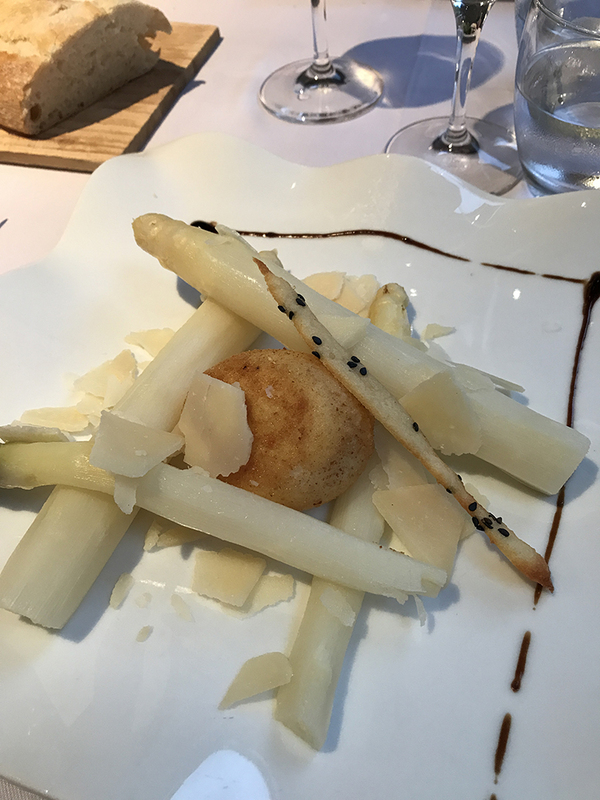 That evening we had a delicious dinner -- for me, an appetizer of asparagus and a fried-boiled egg with parmesan, lamb with squash and a potato tartin, and crepes flambé with orange liquor. For Steve, vegetables and goat cheese appetizer, halibut with rice for entreé and a cheese plate for dessert. There was a screaming child in the restaurant, which went on unabated for a full hour. It got on my nerves and I was glad to leave the dining room and go to bed. It is best not to plan a bicycle trip in a region with lots of wind farms. A tall Belgian blonde can hurt you after a long day of bicycling.